Meet Keith Kavanagh. His hard-drinking, hard-ticket, hooligan ways have made him a legend throughout the southern shore of Newfoundland. Rumour has it he almost burned down the north side of the Cove, his small hometown. But there is another side to the man. He keeps a ragged collection of poetry a closely guarded secret, just as he does his deep regret for the shattered relationship with his father. When Keith meets the darkly exotic Natasha, his life is changed forever. 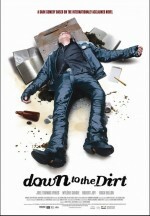 Down to the Dirt is a raw and poignant adaptation of the internationally acclaimed novel by Joel Thomas Hynes, who plays the lead role.